Clubhouse with full bar & catering. On site accommodation. Golf professional shop. Golf practice facilities. 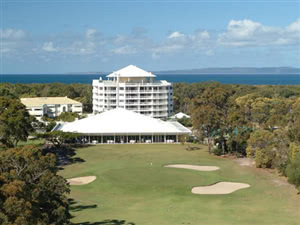 Bribie Island Golf Club is set on one of the sand islands of Moreton Bay (one hour north of Brisbane). Founded over 40 years ago the 18 hole championship layout offers golfers of all levels an enjoyable test of skill. The natural sand base of the island not only provides the gentle undulations of the course but also ensures that the all weather course is well drained and highly playable in all seasons. Guests are always welcome. Contact the club to make arrangements.